"We drink more beer by 10 am ... than most people drink all day! 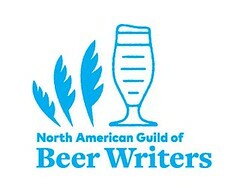 ", said Kristin Orr, General Manager of the Royal Mile Pub, about her plans for the pub's first ever beer breakfast. 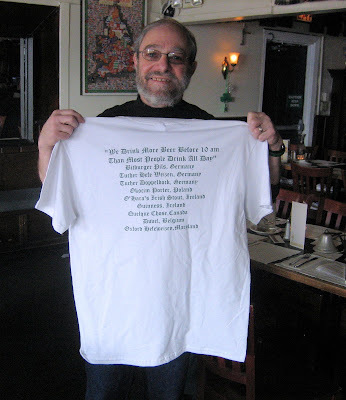 A few years back, Steve Frank - one half of the Brews Brothers, writers on beer for the Mid-Atlantic Brewing News and the Montgomery Gazette - attended a beer breakfast hosted by the redoubtable Don Younger at his Horse Brass Pub in Portland, Oregon. Breakfast fare was prepared with beer and presented with beer - only too well, said Steve. He returned here - sated and happy - and shopped the novel idea around. Receptive was Ken Krucenski, owner/publican of Sean Bolan's Pub in Baltimore, Maryland. From 2000 through its closing in 2006, Sean Bolan's was one of our area's premier beer bars ... and for a short time, my local, when I lived only a few blocks from it. Ken produced several beer breakfasts at Sean Bolan's. But this morning, it's my friends at Royal Mile Pub in Wheaton, Maryland -- Chef/owner Ian Morrison and General Manager Kristin Orr -- who are cooking up their own Beer Breakfast. Guinness (Ireland) served with Oysters on a Half Shell and Golden Raisin Chutney. Kristin asked me to provide commentary. So I began with the Steve Frank/Sean Bolan's connection and the uniqueness of what the Royal Mile was doing that morning - only the third beer breakfast ever in our area. I followed with an anecdote from Eric Warner's book: German Wheat Beer. 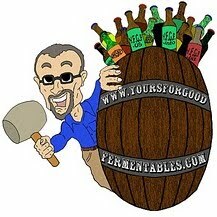 Eric Warner is the brewmaster and a principal of Flying Dog/Wild Goose. The story I read regarded his first (and last) attempt to order coffee for Brotzeit - a morning meal of bread or pretzel - while working at a small brewery outside of Munich. It seems one doesn't drink Kaffee for a 'coffee' break; one drinks weissbier! Quelque Chose - meaning "something else" in Quebecois French - is a strong, uncarbonated ale which is aged over sour cherries for 8 months. The result is tart, spicy, and very refreshing. Some unusual manners in which to serve it include warmed and mulled, over ice with a dash of bitters like Compar i, or, as today, blended 1/3 orange juice, 2/3 Quelque Chose, as a beer mimosa. Unibroue Brewery's Northeast manager, Rick Suarez, suggested this last blend to me. 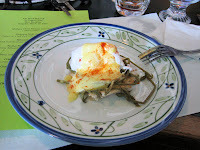 The shoots of young hops are a delicacy in the spring in Belgium, somewhat akin to asparagus season in Germany. This morning, Chef Morrison served them as 'Hops' Benedict. Morrison prepared the Caviar Blinis with Clipper City's Oxford Hefeweizen. The yeast in the beer acted to leaven the pancakes. Also prepared with beer were the Baked Beans with O'Hara's Irish Stout. This might be apostasy, but for the style - gentle roastiness, jet-black color, dry, medium-light bodied - I preferred the O'Hara's over the Guinness. And with none of those silly artificial nitro-bubbles found in the latter. The brewery is Carlow Brewing Company, from Carlow, Ireland, not far from Dublin. Whereas Anglo/American porters are ales, porters of the Baltic nations (e.g., Lithuania, Latvia, Poland, Russia) are dark lagers.The result is similar to an Anglo-porter but with less pronounced fruitiness. Okocim Porter is such, brewed in Poland. It was paired with the last course, a house-made chocolate brownie. It was a lot of food (and beer), but at $45, a bargain. Chef Morrison and GM Orr received loud applause at the breakfast's conclusion. Advance word about the breakfast even played well in Philly. Sean Bolan's Pub has a sister location in Belair, Maryland, which is open and thriving.